In October 2013, a slightly updated version of this post appeared here. That’s what we budget-watchers always say. It’s a great talking point. One that helps bolster the argument that default should not be an option in Washington’s ongoing debt limit slowdown. There’s just one teensy problem: it isn’t true. As Jason Zweig of the Wall Street Journal recently noted, the United States defaulted on some Treasury bills in 1979. And it paid a steep price for stiffing bondholders. The United States thus defaulted because Treasury’s back office was on the fritz. This default was, of course, temporary. Treasury did pay these T-bills after a short delay. But it balked at paying additional interest to cover the period of delay. According to Zivney and Marcus, it required both legal arm twisting and new legislation before Treasury made all investors whole for that additional interest. Some may quibble about whether this constitutes default. After all, the United States did eventually make its payments. And the disruption applied to only a sliver of its debt – certain T-bills owned by individual investors. But I think it’s unambiguous. A debt default occurs anytime a creditor fails to make a timely interest or principal payment. By that standard, the United States did default. It was small. It was unintentional. But it was indeed a default. 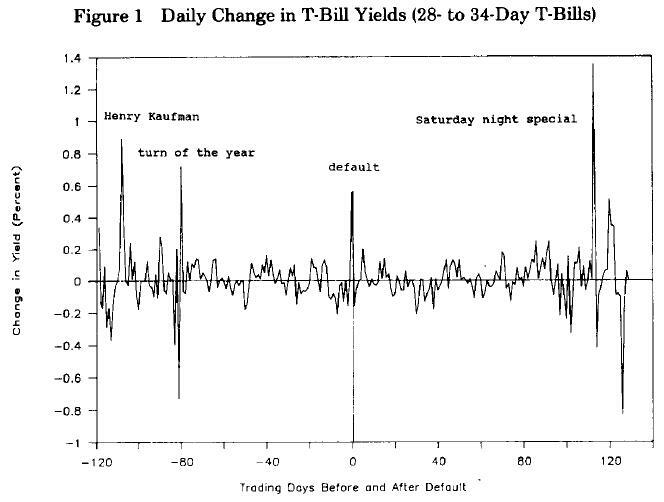 T-bill rates spiked upwards four times in the months around the default. In November 1978, Henry “Dr. Doom” Kaufman predicted that interest rates would rise. They did. Turn-of-the-year cash management caused rates to fall and then rise as 1978 became 1979. And rates spiked and fell in October 1979 when Paul Volcker announced that the Fed would target monetary aggregates rather than interest rates (the “Saturday night special”). But it’s the only data point we have on a U.S. default. Not surprisingly it shows that even temporary default is a bad idea. P.S. Some observers believe the United States also defaulted in 1933 when it abrogated the gold clause. The United States made its payments on time in dollars, but eliminated the option to take payment in gold. For a quick overview of this and related issues, see this blog post by Catherine Rampell at the New York Times and the associated comments. The South did default on Confederate debt used to finance the Civil War and as far as I know, the debt has never been repaid. It was US debt, owned by US citizens, although one can rightly question its purpose. If it not US debt, what is it? Either the South was still part of the US when the debt was issued, so it was US debt, or the South was its own sovereign derived from the former entire US during the Civil War. In the latter case, its debt had as much right to be called US debt as the North’s debt. I do not believe the North after the Civil war assumed any of this defaulted debt, which severely negatively affected its Southern citizens. You state an interesting question. My take is a little different. My interpretation of whether this is US debt would be if it is issued by the United States Treasury or the Treasury was responsible for the payments. They did not issue the bonds via the United States Treasury. In the first instance you mention, I would consider the South’s debt the debt of a section of the country just as a state’s debt is not the resposibility of the United States Treasury. In the second instance, I would say that because the South is its own sovereign it is responsible for its own debts unless the debt is taken on by the US Treasury when the two were joined again. Congress passed a law forbidding the repayment of any debt of the Confederacy or any of the states which had rebelled. This had the intended effect of crippling the Confederacy and it’s component states. Either the South was still part of the US when the debt was issued, so it was US debt, or the South was its own sovereign derived from the former entire US during the Civil War. But you left out an important implicit premise: That “the South” was authorized to issue debt in the name of the United States. While the Lincoln administration never accepted that the so-called Confederacy existed as a sovereign nation, it certainly recognized that there were organized governments of sedition. Those governments were, by definition, illegitimate, and therefore could not obligate the United States by issuing debt. The price of gold started going through the roof after that default, and almost doubled that year. It’s hard to imagine that Congress could be so childish as to threaten default, as a tactic to deal with the deficit. Childish and dangerous. when the feds default on all loans, and the dollar is devalued by 50%, maybe people will think something may have gone wrong with the big o plan to spend his way out of debt. Yeah, mostly in your head. How does an entity, trillions in debt have a outstanding credit rating??? Smoke and mirrors folks, it is better we get this over with now. The whole debt thing is a farce anyways and only exist on paper. What good is a debt ceiling anyways if it just gets raised as soon as we get to it??? I would rather go through immense suffering now so that our children do not have to in the future. We were set up to take a fall, sooner we get it over with, the sooner we can move on…..more than likely something really crappy needs to happen for the people to get angry enough to take back the government. Time to re-introduce lynch mobs into our society and have politicians be afraid to screw the American people. One or two of these scallywags hanging from a tree would change the mindset of a majority of the rest……self interest motivates them and nothing inspires people like this more than their desire to stay alive. Right now their greed for more more more is unquenchable, but properly motivated they would be pleased as punch to be content with what they have. US Defaults: 1790, 1841-1842,1873-1884,1919(multiple states defaulted) 1933 (denied people the ability to receive their payment in gold), and 1971 (owed around 40,000 tonnes of gold but only had 7200 and they defaulted on promises to pay in gold and silver). They also defaulted on some treasury bills in 1979. 1842 was part of a major economic depression period for the USA. It was shortly after President Andrew Jackson terminated the USA’s central bank, the equivalent of today’s Federal Reserve. The USA government, and not an independent bank, became the custodian of the USA funds. It didn’t work out so well then. If the USA Dollar loses its status as the world’s reserve currency, it probably won’t work out so well for the either Federal Reserve or the USA economy this time either. Deficits do not end in debt. When Treasury seeks to find money for deficit spending of Congress, it issues securities, which are IOU’s with a promise to repay the holder the principal plus interest at a specified future date. These securities are sold at public auction to banks. Treasury gets its money from the banks, the banks get the securities (like bills). Treasury has a debt to the banks. The banks also have their reserves drop. The Federal Reserve comes to restore the banks’ reserves and buys these securities from them with fiat money it creates on the spot out of nothing. Fiat money, which the U.S. has had since 1971, is backed by nothing but the full faith and credit of the United States. Money just is tokens of debt obligations in units of account (dollars) between parties in the economy. Its value relative to goods and services is established by countless negotiations between parties as to prices to sell and buy goods and services. That is why nothing limits how much or when it can be created. However, Congress limits how much the government can spend. Without authorization the government cannot spend its money. The act of buying the securities redeems the debt of the United States to the banks, because the Federal Reserve (the Fed) is an agency within the government and it also used exclusive power of the government to create money, in the purchase. The Fed thus can redeem any debt of the United States with fiat money. If the security is not mature when bought, it can be sold by the Fed to control inflation, again at public auction. Otherwise the Fed can replace the mature securities with new securities from the Treasury, as a straight across swap and hold these for sale to others. It is important to distinguish the debt of the United States to certain banks because of Treasury’s purchase, and the ongoing obligations implied in the securities to repay at maturity. A security is like a $100 bill with a redemption date on it. It can serve more than one debt obligation, just as a $100 dollar bill can. If the Fed holds it at maturity, it does not have to be paid after having bought it. It is the government as much as Treasury. It would be the same as the Treasury holding the mature security. It would not pay itself. The Fed is a creation of the Congress, and hence is government. The Fed is so situated within the government as to be independent of political control. Still it must report to Congress several times a year. To achieve this independence, it is prohibited from buying Treasury securities directly from the Treasury. It receives no appropriations from Congress but gets its money for operations from transaction fees on purchases of securities of 6% of the interest. It’s executives are appointed by the President but for terms that last beyond the terms of the President. So, deficit spending produces no national debt at the Fed. You certainly put a new spin on a subject that’s been discussed for many years. Great stuff, just great! on October 7, 2013 at 3:36 pm If we hit the debt ceiling, can Obama choose which bills to pay? 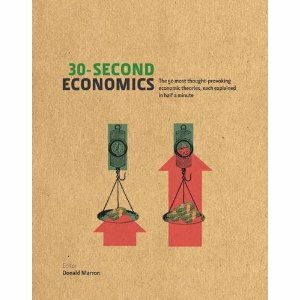 Thanks for finally talking about >The Day the United States Defaulted on Treasury Bills | Donald Marron <Liked it!